A surfer died after being attacked by a shark at Lookout Beach in Plettenberg Bay on Tuesday morning, according to ZigZag. The 48-year-old, who was in the water with five other surfers, reportedly saw the shark before it attacked and shouted out in warning. The shark then attacked, pulling him under the surface. Charles Reitz told ZigZag that he dragged the injured surfer from the waters after the attack. “I was watching the waves. He was in the shallows when I saw the shark take him,” Reitz said. Reitz added that the surfer lost a lot of blood and “his heart stopped twice on the rocks”. 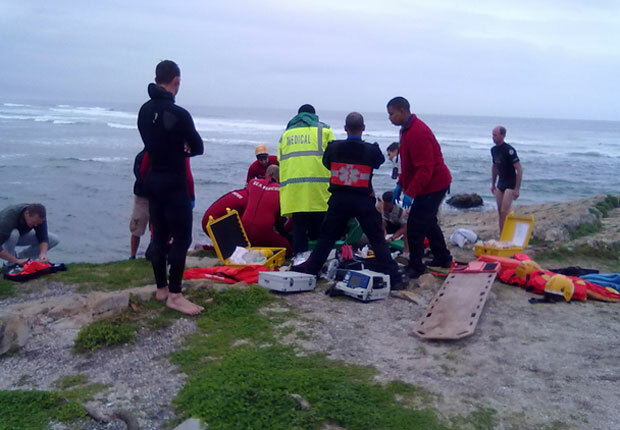 UPDATE: According to Wavescape, the victim is Tim van Heerden, he has died after an unknown shark bit him at Keurbooms River Mouth this morning. It is believe he was bitten in the groin area, and that his femoral artery was servered. Eye witness reports says that the shark looked like a two metre great white shark.